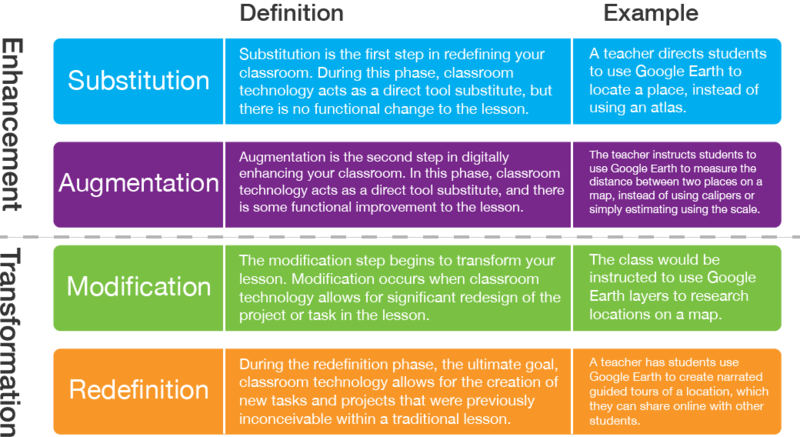 The SAMR Model was developed by Dr. Ruben Puentedura to help teachers infuse technology into teaching. 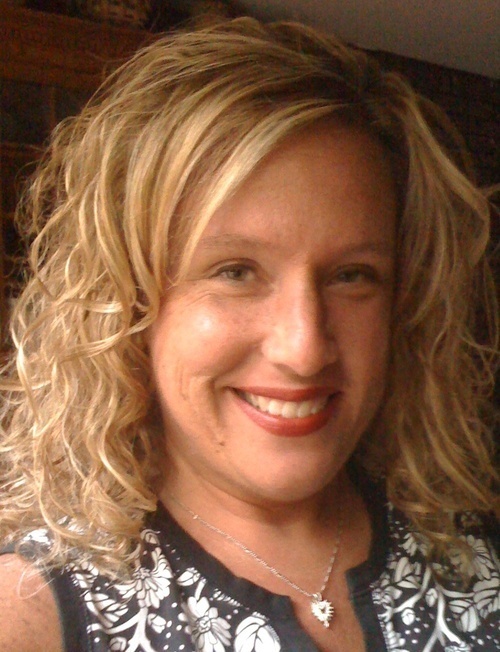 The model allows teachers to evaluate how they are using technology in their instructional practices. 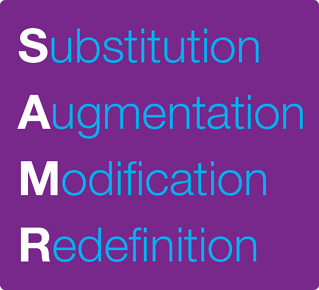 “SAMR” is an acronym that stands for four levels in the technology integration process: Substitution, Augmentation, Modification, and Redefinition. What does each SAMR level look like in the classroom? Below are various classroom examples of SAMR. As one moves through the levels, the technology becomes seamlessly woven into teaching and learning to encourage higher order thinking. Original Project/Lesson: Book Reviews, handwritten and turned in to the teacher. Substitution: Students create book reviews using Google Docs, and share them with the teacher. Augmentation: Students use various add-ons for their book reviews, such as speech recognition, Read&Write for Google for voice notes and word prediction. Modification: Students use Google Classroom to post their book reviews, receive peer feedback, and participate in ongoing discussions about their book. Redefinition: Students use Animoto to create a 30-60 second book trailer. Working with the library media specialist in the school, the students turn the URL of their book trailer into a QR code, and then put their QR code into the book jacket for any student to scan and access the trailer. Original Project/Lesson: Design a Park project, drawn to scale on graph paper, with a letter written on paper to the mayor, stating why their design should be chosen. Substitution: Students use the Internet instead of books to determine actual dimensions of the various items going into their park (playground equipment, building sizes, flower gardens, fountains, etc.). Augmentation: Students use interactive whiteboard software tools such as graph paper and shapes to create their park, drawn to scale. Modification: Instead of a handwritten letter to the mayor, students create a multimedia presentation of why their park should be chosen, with images and a video showing the process of their park design. Redefinition: Students use Tinkercad, a 3-D digital design program, to create their park to scale. Programs such as Snagit or an interactive whiteboard software recorder such as the Recorder feature in the MimioStudio software can be used by the students to record their screen as they explain their park project and why it should be chosen. Original Project/Lesson: Regional Animal Adaptations. Substitution: Students read various articles online about how animals adapt to their environment. Augmentation: Students choose an animal and work in groups on a shared Google Presentation to research their animal and present their findings to the class. Modification: Students put their presentations on a blog or online classroom to write learning reflections, post comments, and discuss peer learning. Redefinition: Students use Skype in the Classroom to meet live with a science museum director to compare/contrast animal adaptations of their region with other animals in other regions of the United States. Prior to the live meeting, they use Google Earth to research various areas and animals of that region to determine what types of adaptations these animals might demonstrate. Original Lesson/Project: Chart paper used to explain the steps of solving a problem. Substitution: An interactive whiteboard replaces chart paper, on which students communicate and explain their steps in solving a problem. Augmentation: The MimioMobile™ app is used so that all student groups can display their steps in solving a problem and work as a class to discuss and analyze the solutions. Modification: Saved solution pages become part of students’ annotated notes of problem solving strategies. Redefinition: Students use various applications such as Explain Everything or the Recorder feature in the MimioStudio software to begin creating their own e-portfolio of problem solving strategies and student math tutorials. All slides have a Creative Commons license, allowing them to be reproduced on other sites, with attribution. 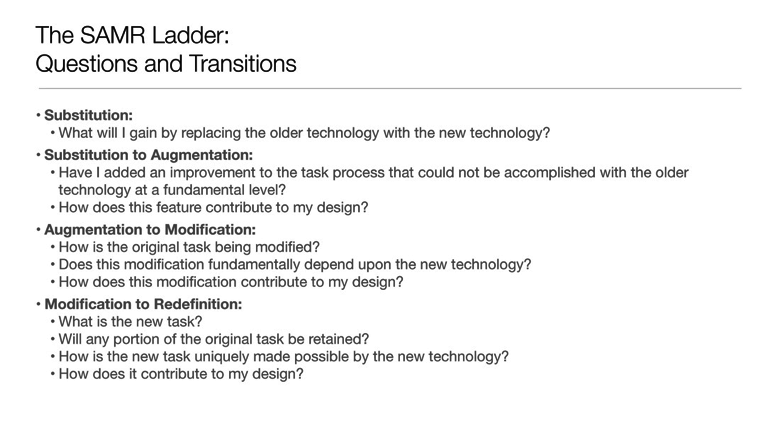 Below is one of his slides that you may wish to refer to as you begin your transition through the various levels of SAMR.